We’ve been lucky enough to shoot countless weddings over the years at this spot and decided it was about time to put together a comprehensive list of things you should know about getting married at San Francisco City Hall whether you’re eloping, having a small intimate ceremony, or renting out the mayor’s balcony or fourth floor gallery. We have said it in the past, and well, I guess there is nothing stopping us from saying it until we are blue in the face, but we really love photographing civil ceremonies at San Francisco City Hall. Maybe it's the expedited time frame and the real spontaneity of the images, the awesome architecture, or the intimacy of a city hall wedding (it's probably all of these things!) but its such a unique wedding day experience. We actually shot our very first wedding at SF City Hall back in the day (2006!) so it’s no wonder why these events have a special place in our hearts. 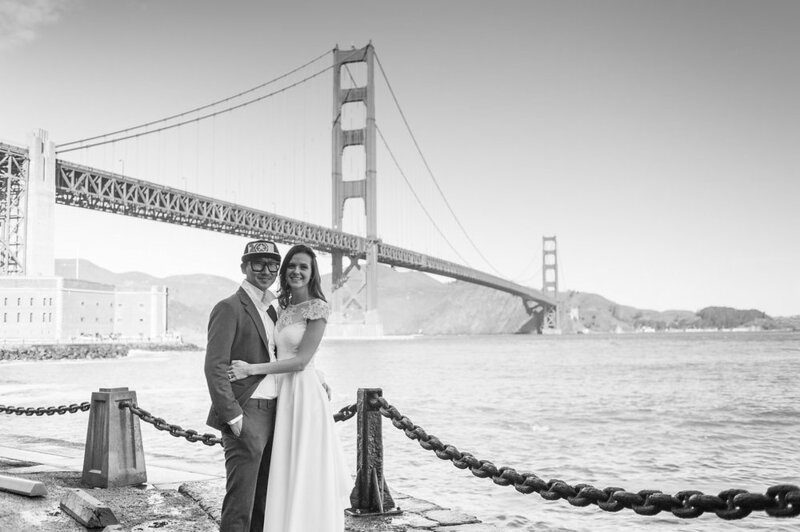 Below you will find all of the important things to know about San Francisco City Hall weddings including hours and times, reservation and marriage license costs, when to arrive, what to expect, ceremony locations, photography packages, and other tips. Think we missed something or have a question? Let us know! You can schedule your civil ceremony reservation at City Hall up to 90 days before your desired wedding date. Reservations are $86 and can be scheduled online. You must have a California Marriage License issued within 90 days before your appointment. You can use the same website to schedule your appointment to get a marriage license which costs $107. If you’re obtaining your marriage license on the same day as your wedding appointment, make sure to schedule your license appointment a minimum of 30 minutes before your ceremony appointment. Read more about Marriage Fees on the County Clerk website. One thing to know about getting married at City Hall is that it’s kind of a wedding circus but that’s certainly not a bad thing, in fact it’s pretty fun! On any given day City Hall marries dozens upon dozens of couples. Wedding ceremonies take place Monday through Friday between the hours of 9:00am and 3:30pm. Ceremonies take place every half hour and there are 3 slots per hour. In our experience, the busiest day of the week is always Friday. Ceremonies are super quick lasting only about 5 to 10 minutes total. Due to the expedited timeframe, it’s best to leave family and couple portraits until after your ceremony. If you’ve already received your California Marriage License, make sure you arrive 10 minutes early before your ceremony reservation time and check in at the Information Desk located in Room 168. You will receive a ticket with a number. Wait for your number to appear on the hallway monitors. Make sure you have your valid marriage license, government issued photo ID, and 1 witness. Once your number is called proceed to the Information Desk and they will direct you to your commissioner. No more than 2 witnesses (including your photographer) are allowed in the room at this point. Additional guests must wait in the lobby outside of Room 168 until you make your way to the ceremony. Technically there is a 6 guest limit for your wedding ceremony but we’ve definitely seen ceremonies that are larger in size. If you respect the space and all of your guests are ready to go at the time of your ceremony it likely won’t be an issue. Make sure to read the full rules and guidelines on the County Clerk’s website. If you read the City Hall website you’ll see that ceremony locations are picked by the commissioner and either take place in the rotunda or in a private ceremony room. They explicitly state that specific requests will not be accepted. While this may be true, in our experience many commissioners will ask if you have a location preference shortly before the ceremony. However, on a busy day this is unlikely to happen and your wedding ceremony will likely occur in the rotunda. In the event that you do get to pick your ceremony location, we love shooting on the sides of the building where natural light is at its brightest. The third and fourth floor are particularly magical. The rotunda at the top of the grand staircase is beautiful but it can be a little dark on an overcast day. If you feel strongly towards your ceremony location and want to reserve the Mayor’s Balcony or Fourth Floor Gallery you can do so for $1000. You can also reserve the Grand Staircase on Saturdays for $5000. Learn more about one hour and two hour wedding ceremonies on the City Hall Events website. It’s easy to forget that this is a working government building but thankfully cameras and camcorders are encouraged. Choosing the right place to take photos isn’t a difficult decision as the natural light and beautiful architecture make just about anywhere a great photo background. While San Francisco City Hall is a busy place filled with lots of newlyweds, it’s possible to find your own quiet spot to shoot photos. If you want to take photos in an area that’s busy, wait it out and in a few minutes the space will clear. Most photographers and newlyweds are respectful and know how to share this very popular, beautiful building. These are technically two different locations but they’re nearby to one another and depending on time and parking it can be pretty doable to hit both. The Main Lawn of the Presidio provides access to historic military buildings and the beautiful facade of the San Francisco Film Centre. Also nearby is the eucalyptus and cypress lined Lovers’ Lane. Closer to the waters edge, Crissy Field is a wide open green space with views of the Golden Gate. Right at the base of the Golden Gate Bridge the area around Fort Point delivers jaw dropping views of the famous red suspension bridge. Located in the middle of the San Francisco Bay where the Bay Bridge meets Yerba Buena Island. Treasure Island has amazing views of the San Francisco city skyline and depending on weather and time of day it can make for an impressive backdrop for wedding portraits. We love shooting elopements and weddings at City Hall. It’s one of those wedding venues for us that always gets us excited to return. We’ve photographed many, many weddings here and we’re very familiar with the process. We have specific photography packages for civil ceremonies held Monday through Friday. Whether you want to document just your civil ceremony and some family portraits or you prefer to make an afternoon of it and explore San Francisco we’ve got you covered. 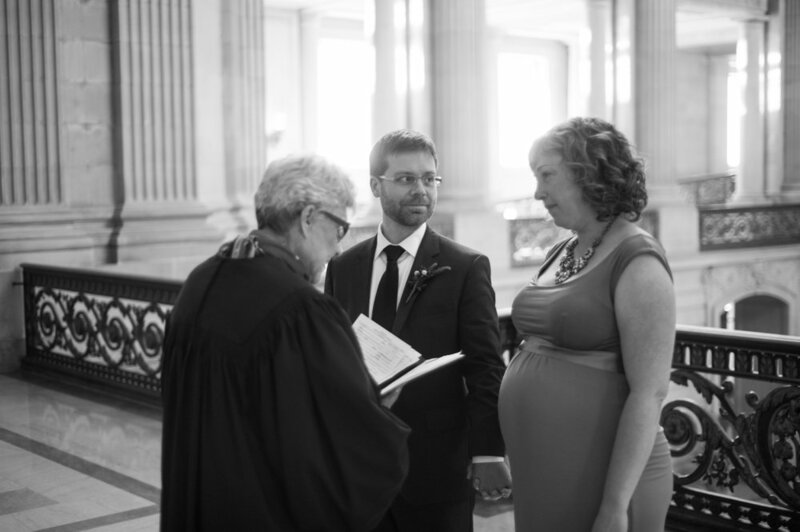 Ready to book your San Francisco City Hall Wedding Photographer? Mention this article and receive $100 off your booking. We’ve documented weddings throughout the Bay Area for over a decade. Along the way we’ve seen a lot of wedding venues and SF City Hall is up at the top of the list. We can’t wait to hear from you and learn more about your wedding day and what you have planned. Complete the form below and we’ll be back in touch with you in about 24 hours. Tell us a little about yourself! What attracted you about getting married at SF City Hall? Why is photography important to you? Have any questions? Ask away! Thank you! We try our best to return inquiries within 24 hours. We can’t wait to learn more about you and see how we can help document your day!